Prosecutors asked the South Jakarta District Court to sentence former trade and industry minister and former chief of the State Logistics Agency (Bulog) Rahardi Ramelan to five years in jail for graft. A dozen anti-U.S. protesters rallied in front of the U.S. Embassy in Jakarta, denouncing U.S. government moves against Iraq and the possibility of military strikes. Army chief Gen. Ryamizard Ryacudu dismissed 20 soldiers found to be involved in the deadly brawl with police officers in the North Sumatran town of Binjai. Iraqi Minister of Education and Scientific Research Humam Abdul-Khaleg Abdul-Ghafur met with President Megawati Soekarnoputri in Jakarta, proposing that Indonesia play a role in setting up a "companion team" to monitor U.N. weapons inspectors should they re-enter the country. President Megawati Soekarnoputri greeted visiting former South African president Nelson Mandela at the Presidential Palace in Jakarta. Indonesia and the United States signed an agreement that rescheduled US$485.5 million in principal and interest payments on Indonesia's official debt to the U.S.
Around 500 workers of PT Doson Indonesia, a subcontractor of shoe giant Nike, held a demonstration in front of the building that houses Nike's Indonesian offices to protest Nike's withdrawal of orders from their firm that resulted in their terminations. Indonesia, as host, opened a two-day meeting of the Southwest Pacific Dialogue Forum here to seek reconfirmation of support for its territorial integrity from the six-member forum. President Megawati Soekarnoputri asked the Indonesian military (TNI) to improve its professionalism in her address marking the celebration of TNI's 57th anniversary at the Air Force's Halim Perdanakusumah air base in East Jakarta. Thousands of people from various Muslim organizations staged noisy demonstrations in Surabaya and Surakarta, condemning U.S. policy on Iraq. The Central Jakarta police named eight members of the radical Islam Defenders Front (FPI) as suspects following recent attacks by the organization's activists on a number of nightspots and billiard centers in Jakarta. The government and the House of Representatives agreed to start deliberations on an antiterrorism bill. Minister of Home Affairs Hari Sabarno swore in Jakarta Governor Sutiyoso for a second five-year term along with his vice governor Fauzi Bowo, while anticipated protests failed to materialize. Mongolian Prime Minister Nambaryn Enkhbayar arrived in Jakarta for a four-day visit and met privately with President Megawati Soekarnoputri at the Merdeka Palace. Hasyim Muzadi, chairman of the influential Nahdlatul Ulama (NU) Muslim organization, said during a meeting with members of the British parliament that NU would do its best to minimize radical movements in the archipelago through dialogue with Moslem hardliners. Some 200 people from a number of different Muslim organizations held a peaceful rally outside the U.S. Embassy here, protesting a possible U.S. attack on Iraq. A territorial commander of the separatist Free Aceh Movement (GAM), identified as Abu Arafah, alias Ibrahim, 33, was shot dead at an isolated village in Aceh. Nearly 200 people were killed and more than 300 injured, including foreigners, in a series of bomb explosions on Indonesia's popular resort island of Bali. The Indonesian government strongly condemned the bomb blast on the resort island of Bali that claimed many lives. Defense Minister Matori Abdul Djalil blamed Osama bin Laden's al-Qaeda terrorist group for the bomb incidents in Bali that claimed almost 200 lives. Abu Bakar Ba'asyir, chairman of the militant Indonesian Mujahidin Council (MMI), and Habib Rizieq Shihab, leader of the Islam Defenders Front (FPI), accused the U.S. of being behind the deadly Bali bomb blasts that killed nearly 200 people. Laskar Jihad leader Ja'far Umar Thalib announced the militant group's dissolution. Indonesian President Megawati Soekarnoputri had a one-hour meeting with Australian Minister of Foreign Affairs Alexander Downer and Minister of Justice Chris Ellison at the State Palace in Jakarta. A team sent abroad by the national police headquarters and the National Intelligence Board (BIN) started its questioning of suspected terrorist informant Omar Al-Faruq. Australia urged its citizens in Indonesia to consider leaving the country, saying that it had received disturbing new information of threats to Australians in the wake of the Bali bombings. Jakarta police arrested the head of the Islamic Defender Front (FPI), Habib Rizieq, after questioning him for 13 hours. Police arrested Abu Bakar Ba'asyir, leader of the Indonesian Mujahidin Council (MMI) and headmaster of the Al Mukmin Ngruki School, in his hospital bed. The National Police signed an agreement with Australia to jointly investigate the Bali tragedy. Indonesian police Inspector General I Made Mangku Pastika was chosen to head the investigation team. Two emergency anti-terrorism decrees were signed by President Megawati Soekarnoputri in Jakarta. Free Aceh Movement (GAM) leader Muzakir Manaf denied that the movement is involved in the Mujahiddin network in Southeast Asia or the Bali bombing on October 12. The Ambon District Court sentenced 14 men to prison terms ranging from two to five years for raising four flags of the outlawed South Maluku Republic in the provincial capital Ambon in April. The Australia Security Intelligence Organisation (ASIO) set up a permanent office in Jakarta as part of moves to step up regional counter-terrorism efforts following the Bali bombing. A number of legislators from the Golkar Party faction of the House of Representatives signed a letter demanding House Speaker Akbar Tandjung resign over his corruption conviction. The U.S. Federal Bureau of Investigation (FBI) warned Garuda Indonesia Airlines of a possible terrorist attack against the state-owned airlines. President Megawati Soekarnoputri arrived in Mexico to attend the Asia-Pacific Economic Cooperation (APEC) summit, hoping to convince fellow Asia-Pacific leaders that she was determined to fight extremists. Hundreds of people staged a rally to support Muslim cleric Abu Bakar Bashir, who is in custody in his hometown of Solo on suspicions of having links with terrorism. Japanese Prime Minister Junichiro Koizumi announced that his government would extend US$26 million in emergency aid to Indonesia to help it recover from the Bali explosions that killed nearly 200 people. U.S. President George W. Bush met with Indonesian President Megawati Soekarnoputri for talks on the sidelines of the APEC summit. Thousands of Muslims in the Indonesian province of Aceh held prayers for planned peace talks aimed at ending decades of violence in the province. Supporters of Muslim cleric Abu Bakar Ba'asyir displayed posters denouncing the U.S. as Indonesian soldiers were deployed during a protest in Solo, Central Java. Abu Bakar Ba'asyir was later taken to Jakarta by police from his bed at the Muhammadiyah Hospital in Surakarta (Solo), where he had been receiving treatment. Afterwards, supporters in Jakarta gathered at the front gates of the national police headquarters to protest his arrest. President Megawati Soekarnoputri reaffirmed that the measures taken by her government to handle the aftermath of the Bali bombings were not due to pressure from the U.S. government. Lt. Gen. Djaja Suparman denied media reports that he was in Bali between October 11 and October 13. Coordinating Minister for Political and Security Affairs Susilo Bambang Yudhoyono denied rumors that two generals were involved in the Bali bombings. Indonesian President Megawati Soekarnoputri, accompanied by local officials, visited the site of the 12 October bomb blasts in Kuta, Bali. Syafi'i Ma'arif, chairman of Muhammadiyah, warned the Indonesian government against arresting other Muslim leaders. U.S. Ambassador Ralph Boyce presented a series of mini-documentaries about Muslims living in the United States to an audience of Indonesian journalists and academics in Jakarta. Benny Wenda, a detained separatist leader in Papua, escaped along with another inmate. Prosecutors demanded a 10-year jail sentence for Eurico Guterres, a former pro-Indonesian militia leader accused of crimes against humanity in East Timor. Hundreds of young Acehnese rallied in front of the United Nations office in Jakarta, demanding a ceasefire in their homeland where separatist rebels are fighting for an independent state. Despite opposition from human rights activists, the government and the House of Representatives agreed on Monday to start deliberations on the antiterrorism bill as part of its effort to combat terrorism in the country. Coordinating Minister for Political and Security Affairs Susilo Bambang Yudhoyono said the proposed law would provide legal grounds for upholding national security from possible terrorist attacks. "In a very short time, we will submit the antiterrorism bill to the House for further deliberation," he told a news conference after a consultative meeting between the government and the House. The meeting was also attended by House Speaker Akbar Tandjung, Minister of Justice and Human Rights Yusril Ihza Mahendra, National Police chief Gen. Da'i Bachtiar and National Intelligence Body (BIN) chief A.M. Hendropriyono. Minister Yusril said the bill was almost ready and currently in the hands of Coordinating Minister Susilo for further reading. "By the end of this month, we hope to inform the public about its contents, get input from them and then put it before the House," he said. Yusril said the bill identifies seven kinds of terrorist activities as opposed to ordinary crimes. Anyone carrying weapons, explosives or chemical substances that threaten the public's safety and could be used for terrorist attacks could be charged with conducting terrorism. Other activities, such as bombing supermarkets, destroying public facilities or vital infrastructure and foreign premises, would also be categorized as terrorist activities. "Those activities would come under the planned antiterrorism law, while other crimes, such as murders, will be under the criminal code," he said. Human rights activists have voiced their opposition against the drafting of the antiterrorism bill, fearing that the bill -- when passed into law -- could be used by power holders to silence critics or political opponents. Despite the opposition, the government has insisted on continuing the draft of the antiterrorism bill in an apparent effort to ease foreign pressure, especially from the U.S., which has asked Indonesia to do more in its fight against terrorism. Indonesia has been accused by a number of foreign countries of being a safe haven for terrorists linked to al-Qaeda. The government and security authorities initially denied the accusation, but as pressure mounts from foreign countries, including the U.S., security forces have started to take serious action against alleged terrorists. The National Police have arrested and deported a suspected senior al-Qaeda operative, Omar al-Faruq, and detained another suspected terrorist, Seyam Reda, a German national of Arab descent. National Police chief Gen. Da'i Bachtiar said on Monday that he would send a team of three policemen and intelligence officers to the U.S. to interrogate al-Faruq. "We have gotten a green light from the U.S. government, and we'll decide when we're going to leave," he said. Proposed antiterrorism legislation says that combating terrorist acts must not violate the law, human rights or discriminate against people based on tribes, race, religion or groups. The latest draft law, obtained by The Jakarta Post on Tuesday, says that cases taken to court under antiterrorism legislation will respect Criminal Code procedures, unless the antiterrorism law stipulates otherwise in exceptional circumstances. The bill defines terrorism as an illegal act carried out intentionally that endangers people and their belongings or sparks widespread destruction, fear or causes deaths. Terrorism, therefore, can be judged as damage to a range of targets, including assets, the environment, state secrets, culture, education, the economy, technology and industry. The bill threatens terrorists with a minimum three years in jail and a maximum sentence of death. Capital punishment will also be imposed on terrorists who commit attacks using airplanes, or those who misuse chemical, biological or nuclear materials, it says. Those who have the intention to carry out such attacks could be sentenced to up to 15 years jail, the bill reads. Anyone who smuggles in or out of Indonesia, or manufactures, receives, hides, or uses weapons, ammunition or explosives with the intention to terrorize others will also face death. A company convicted of organizing a terrorist act will be fined Rp 1 trillion (US$111 million) and will be dissolved and declared a banned organization. The bill also says that investigators, prosecutors and judges can order banks to block and disclose accounts and other properties of suspected terrorists. When investigating terrorism, the bill stipulates that bank secrecy laws do not count. The government and the House of Representatives said Monday they had agreed to debate the bill as part of efforts to combat international terrorism in the country. But human rights activists Hendardi of the Indonesian Legal Aid and Advocacy Association (PBHI) and Daniel Pandjaitan of the Indonesian Legal Aid Institute (YLBHI) urged the government not to rush to endorse the bill. "I don't see the relevance yet as we have not yet suffered from the terrorist acts described in the bill," Hendardi said on Tuesday. "Introduce it to the public first, but get feedback, consider it and endorse it in the next three to five years," Daniel said. Besides, Hendardi said, numerous articles of the bill were prone to human rights abuses, citing a clause in the bill that an intention to commit a terrorist act could be punished. The article that stipulated investigators could ignore bank secrecy laws and investigate bank account details infringed human rights, he said. The United States scored its latest legal success in its war on terror today when Malaysia deported a California-born man, Ahmed Ibrahim Bilal, 24, who is wanted in his homeland on charges of conspiring to join and help al-Qaida. Kuala Lumpur's role in expelling the student at the International Islamic University's campus in Selangor state was made considerably easier by Washington sneakily revoking his passport, thereby making Bilal an illegal immigrant and leaving him without much of a legal defence. If the United States had not done this, the case would probably have dragged on for months - an Italian businessman wanted by India in connection with a 15-year-old arms scandal has been fighting deportation from Malaysia for more than a year. But while bureaucrats in Oregon, where Bilal is thought to be heading, might be patting themselves on the back over their triumph, the incident could soon be eclipsed by events unfolding in Malaysia's southern neighbour, Indonesia. For the world's most populous Muslim nation, which is witnessing a revival of Islamism and for the most part has refused to admit is has any sort of terrorism problem whatsoever, is, in Washington's eyes, at last starting to come on side. In the last few weeks a bevy of high-ranking officials have finally admitted that foreign terrorists, including al-Qaida members, have either passed through or been based in Indonesia. While in the country these operatives have even trained local radicals and plotted a variety of attacks, including a couple of assassination attempts on President Megawati Sukarnoputri. The defining moment in this change of attitude is considered to be a recent visit by Karen Brooks, a senior south-east Asia expert at the American government's national security council. Ms Brooks, whose relationship with Ms Megawati goes back years, persuaded her old friend with video evidence and Javanese exhortations (a language in which she is fluent) of the reality within the president's porous borders. It was not as if Ms Megawati should have needed much persuading. After all, Indonesia had already quietly deported at least two alleged terrorists wanted by Washington. These included Omar al-Farouq, the Kuwaiti married to an Indonesian who is thought to be among al-Qaida's most senior agents in the region. It was al-Farouq's testimony that prompted Washington to shut many of its embassies in the region during the September 11 anniversary commemorations. There was widespread consternation in Jakarta at the time as officials, led by vice president Hamzah Haz, insisted the closure was unjustified. Their complaints are now consigned to history and Indonesia's police and intelligence services are reportedly busy hunting down other foreign terrorists thought to be in the country. While Ms Megawati's conversion to the anti-terrorism cause will greatly cheer Washington and her much more proactive neighbours, it is, however, far from complete. There has, crucially, been no public acknowledgement that Indonesians might be involved in international terrorism. It costs little political capital to round up foreigners but in highly volatile Indonesia, where law enforcement is weak and radical Islam is gaining strength, taking on domestic groups is a very different proposition. So while Singapore, Malaysia and the Philippines have been detaining their nationals without charge on suspicion of committing terrorist activities, Ms Megawati has not followed suit. This is in spite of strong and repeated demands for her to do so. Top of the list of Indonesian terrorist suspects is Abu Bakar Ba'asyir, an Islamic cleric who leads the Indonesian mujahedin council and the alleged head of Jemaah Islamiyah, a pan-south-east Asian extremist group that wants to create one large Islamic state in the region. Singapore and Malaysia claim Jemaah Islamiyah is using terrorist methods to do so but no smoking gun has been produced and Jakarta says it has no evidence to detain Mr Ba'asyir, who insists he has no link to the organisation. It is hard to say whether the ardent nationalist Ms Megawati will succumb to the external pressure and take the next, and much tougher, step of clamping down on - or at least investigating - radical Islamist groups. Unless the current relative calm is disrupted the answer will probably be no. But by the middle of next year, when the 2004 general election will very much be within sight, political expediency might well persuade her to take another course. Very little happens in Indonesian politics without an ulterior motive and the fight in the war on Islamist terror is no exception. The proposed antiterrorism bill would not be effective as long as it defined terrorist acts as non-political crimes, experts said Wednesday. Kusnanto Anggoro of the Center for Strategic and International Studies (CSIS) was referring to article five of the bill, which stipulated that terrorism was not a political or politically motivated crime. The latest draft of the bill defines terrorism as an illegal act carried out intentionally that endangers property and people and their belongings or causes fear, damage or death. Terrorism, therefore, can be judged as damage to a range of targets, including people, assets, the environment, state secrets, culture, education, the economy, technology and industry. The exclusion of terrorist acts from political crimes, Kusnanto said, ruled out any possibility that terrorism had political motives to alter national policy. "A terrorist act has a political motive and it is not an ordinary crime under the Criminal Code like theft." He said the article would easily be misused by groups claiming their actions were political. Riefqi Muna of the Research Institute for Democracy and Peace (Ridep) said the bill must be rejected as, among other things, it did not clearly define a terrorist act and did not define terrorism as a political crime. "The bill is not clear, we reject it," he told the Post. Kusnanto said the bill must be revised to make it applicable and to minimize violations of human rights. Commission for Missing Persons and Victims of Violence (Kontras) coordinator Ori Rahman said it rejected the bill as it had numerous articles that could spark human rights abuses. "Although the bill stipulates that combating terrorism must not violate the law and human rights, it contains numerous articles that are open to human rights violation." For example, he said an article on the interrogation of suspected terrorist was vague, as it was unclear if a suspect had the right to consult a lawyer. Other articles that were prone to abuse, included the investigators' authority to order banks to disclose details of bank accounts and to close them, he said. Ori said the creation of antiterrorism legislation would not resolve terrorist problems in the country as the problems centered around the National Police's inability so solve terror cases. "The police have failed to trace terrorist networks in the past few years. If the antiterrorism bill is endorsed, will the performance of the police improve?" he asked. Reform faction legislator Imam Addaruqutni, who sits on the House of Representatives' Commission I overseeing defense and foreign affairs, said the bill did not yet reflect the needs of Indonesians. "It doesn't solve the problem that in the past, terror activities were carried out by the military to oppress people. The bill does not ensure the activities will not reoccur," he said. Imam also urged the government to drop any articles in the antiterrorism bill that violated human rights. Kusnanto also criticized the planned establishment of an ad hoc task unit to formulate antiterrorism policy and strategy. "It will only strengthen state institutions power over the public," he said without elaborating. *Terrorists who attack using airplanes, or those who misuse chemical, biological or nuclear materials will be sentenced to death. *Anyone who smuggles in or out of Indonesia, or manufactures, receives, hides, or uses weapons, ammunition or explosives with the intention to terrorize others will be sentenced to death. * A company convicted of organizing a terrorist act will be fined a maximum Rp 1 trillion (US$111 million), dissolved and banned. AUSTRALIAN authorities have flatly denied any warning about the Bali terrorist attack had been passed on by Indonesia. And they have slammed Indonesia, accusing it of ignoring numerous warnings about the terrorist threat. One senior source said the Indonesians failed to take the prospect seriously. "Numerous people have spoken to them about taking it seriously," the source said. "If the Indonesians won't take action it is very difficult for foreign governments." Indonesian opposition MP Alvin Lie said he and other parliamentarians had been warned of an imminent attack. "I believe the Indonesian intelligence has been warned about this," he said. A senior Australian official said he could not comment on whether or not Indonesia had been warned, but was adamant no warning had been passed on. The official said the government had been deeply concerned for months that something nasty would happen if the Indonesians did not get on top of the terrorist threat. A number of groups including Osama bin Laden's al-Qaeda network have strong links in the world's biggest Muslim country. "There are a lot of nasty groups operating there," the official said. Government sources admitted the attack by definition constituted an intelligence failure. "This is the sort of thing which ought to be picked up on," the official added. JAKARTA (Agencies): Two leaders of Muslim militant groups on Monday accused the U.S. of being behind the deadly Bali bomb blasts that killed at least 187 people over the weekend. However, no evidence was offered to support their accusations. "We deplore and condemn the masterminds, fund raisers and whoever was involved in the bomb explosions in Bali," said Habib Rizieq Shihab, leader of the Islam Defenders Front (FPI), a Muslim militant group best known for its frequent attacks on bars, and other nightspots in Jakarta. "The incident could be used as reason for the United States and its allies to justify their accusations that Indonesia is a terrorist network base," Shihab said as quoted by DPA. Two massive explosions ripped through packed discos on Jl. Legian street in Kuta, a well-known entertainment strip in Bali, shortly before midnight on Saturday, killing at least 187 people and injuring another 300 others. Meanwhile, Abu Bakar Ba'asyir, chairman of another militant group the Indonesian Mujahidin Council (MMI), also accused the U.S. of being behind the explosions in Bali. "The U.S. intelligence agency is behind the Bali bombings in an attempt to justify their accusation that Indonesia is a terrorist base," said Abu Bakar, suspected to be the leader of Jema'ah Islamiyah (JI), a group that allegedly plans to establish a pan-Islamic state in Southeast Asia. Dozens of JI members have been arrested in Singapore and Malaysia, where the group has been accused of having links with the al-Qaeda international terrorist organization headed by Osama bin Laden. Indonesia, which abolished its draconian internal security act in 1998, has refused to arrest Ba'asyir on the grounds that there is no evidence that he has committed crimes in Indonesia. Abu Bakar warned the Indonesian government and security officials not to be trapped in the U.S.'s strategy, and to refrain from declaring that a terrorist network exists in the country. More than 85 per cent of Indonesia's 215 million people are Muslims, making it the world's most populous Islamic nation and making crackdowns on Muslim radicals a very political issue for the government. The government of President Megawati Soekarnoputri has been widely criticized for failing to crack down on terrorist suspects in the aftermath of the Sept. 11 terrorist attacks in the U.S. Many Indonesian Muslim clerics and academics on Monday were raising questions about who could be behind the Bali tragedy, which has seemingly justified a stronger government stance against terrorists and their sympathizers. 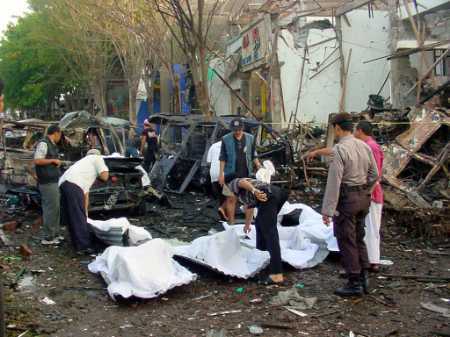 "Such a car bomb blast could be linked to the work of foreigners, especially the U.S. in a bid to attack hard-line groups deemed as terrorists," said M. Budyatna, a noted political observer and former dean of social and political studies at the University of Indonesia. "The terrorist label is intentionally given to Muslims in Indonesia in a bid to justify its hypothesis and in the hope of stigmatizing Indonesia in the eyes of international community," said another political expert Nadjamuddin Muhammad Rasul. But moderate Muslim cleric Hasjim Muzadi, chairman of the Indonesia's largest Islamic organization, Nahdlatul Ulama (NU), said that the blasts ran counter to Islamic values, humanism and nationalism. "The bloody blast is really inflicting sorrow on the bereaved families and runs counter to the country's unity and good relations with other nations in the world," Antara quoted Muzadi as saying. Ralph Boyce, U.S. Ambassador to Jakarta warned Indonesian government a few days prior to the blast in Balli that it must take action against terrorist groups, which pose threats to westerners or the U.S. would start withdrawing its diplomatic staff. What was interesting is the CIA was very angry with Indonesian authorities, and outright told them that terror attacks would occur if they didn't cooperate. What we see is new anti-terrorism legislation being slammed through the Indonesian parliament, similar to the US Patriot law, by using the Bali "terrorist" attacks which costed the lives of hundreds of innocents. Meanwhile, the government came up with various suspects, one of whom even got his own press conference. I've rarely seen terrorists, under arrest, being given the privilege to give a press conference. And Jamaat Islamiya, the terrorist organisation supposedly behind the Bali attacks ? According to the US government, this organisation was founded in the early nineties, as a "sister organisation" of Al Qaeda. According to regular historical documents, Jamaat Islamiya was founded in 1978, and has close links to the Indonesian military (same goes for Laskar Jihad, which was disbanded on the day of the Bali bombing). These organisations were used to reinforce the power of the Indonesian army, and this time it's used to facilitate renewed cooperation between the US, Indonesian and Australian military forces under the guise of terrorism. The attacks furthermore gives the U.S. "credibility" claiming that Indonesia is becoming a base of operations for terrorists. The main strategic goal is to open military bases in Indonesia, in order to provide the sphere of influence of the United States, and to contain China by increasing US presence in Asia. The Bali attack was just another step in US Foreign Policy, combined with interests of regional partners. as an attack against Islam." US Citizens warned to Stay away from Bars. Who were the nightclub bombers of paradise isle ? The disclosure in yesterday's New York Times that US Ambassador to Indonesia Ralph Boyce delivered the latest warning a day before the blasts will serve only to reinforce criticism about Jakarta's slow response and failure to heed intelligence about the terror menace in its midst. Pressure was on not to say anything about the blast in the first place! 12 Oktober 2002, in the late evening, a terrorist attack struck the tourist island of Bali. At least two car bombs exploded near Sari Club and Padi Club in the heart of Kuta, along Jalan Legian. Sari club was completely demolished and over 180 people were killed, several hundred were injured. Below is the latest news about bali, as well as detailed information about the location of the club and an image I personally made in July 2002. 14 October 2002 ? Preliminary list of casualties 14 Oct.
? Copyright Freedom Files Website www.freedomfiles.org ( Rob Hay ) 2003 For fair use only/ pour usage ?quitable seulement .